Reflecting on the changing faces of Liverpool, club culture and hip-hop, Getintothis’ James Zaremba chats to Gilles Peterson ahead of his Freeze gig – and gets some tips on how to construct the perfect DJ set. From pioneering London’s pirate radio culture in the 1980s to becoming a self proclaimed worldwide curator of sound, it is impossible (if not even foolish) to comprehend Britain’s musical climate without first understanding Gilles Peterson. Regardless of genre, generation or sound the Brownswood Recordings head honcho has had a profound impact upon the music you listen to. Gilles Peterson returns after joining up with Bonobo back in the summer at the Bombed Out Church for Freeze’s final 10th anniversary show in 2015. As one of the UK’s most dedicated DJs, broadcasters, producers, compilers, record label bosses and avid record collectors, he joins the dots between soul, hip-hop, house, Afro, Latin and electronica. With his annual Worldwide Festival and awards show, Gilles’ travels continue to enrich and expand his vast record collection to create magical musical journeys, with an extended set taking place on Friday December 18. Freeze has grown in tandem with Liverpool’s continued cultural resurgence, charting their unique course across the vibrant electronic music spectrum. With its DNA all about seeking the region’s most intimate, quirky and stunning venues – including everywhere from the Anglican Cathedral and St George’s Hall to tunnels and warehouses – 2015 has seen Freeze host parties at The Bombed Out Church, The Asylum, The Lemon Lounge and Manchester Cathedral and many more amazing venues through their sublime 10th anniversary. Between running his multiple imprints, a weekly show on Radio 6, curating an endless list of compilations and delighting crowds the world over with his marathon DJ sets we were lucky enough to catch Gilles at his Brownswood studio for a brief discussion on all things Liverpool, club culture and hip-hop. Getintothis: It is nice to finally speak with you – you are a very hard man to get a hold of! Getintothis: Liverpool is obviously a city deeply connected with its musical history as well as having a bright future in club culture. Where do you think the city stands as a hotspot for musical discovery today? Gilles: “I feel that Liverpool was taken over a little bit by the rest of the country when it came to electronic music and club culture. A big part of Liverpool still has a 60s and 70s heritage – it can be hard to escape that sometimes. When you have such a strong global impact with one particular scene it can be hard to redefine a cultural image. “It’s like Paris, if you go there they still cook the same food in the same restaurants whereas in other cities without so much history – they can progress quicker. But I do feel that Liverpool is escaping the clutches of its past and I do love going up there. Getintothis: Have you heard much about the up and coming parties and venues in the city? We do feel that there is currently a strive for diversity among promoters and club owners. Gilles: “Doing the Freeze party back in the summer was incredible, I loved the fact that they had used an abandoned church and there was such a great crowd as well. I do feel that there is a really interesting generation right now of people that want to go clubbing but don’t want to be thrown into that Ibiza, stereotypical crap. Getintothis: You talk about Liverpool needing to come out of the past, have you heard much about the Baltic Triangle area and the endeavours of venues to reimagine the clubbing experience? Getintothis: While we’re talking about sound systems then – In terms of your DJ sets you obviously release a great range of music out of Talkin’ Loud and Brownswood. You curate Sun Ra compilations but you also hang out with Four Tet. Do you find it hard to please everybody who comes to a Gilles Peterson show? With different people possibly expecting to hear different things? Gilles: “I find the best way to deal with that more and more these days is to play six hour sets! Coming on after some big house DJ and only getting 90 minutes before having to hand over to some bloke playing drum and bass is difficult. I try and avoid those kind of gigs! Getintothis: Is there a line then between being purposefully eclectic with your selections and actually building a set of cross-genre records that take people on a musical journey? Gilles: “A great part of it is to still be able to build a set. As a DJ, club culture is my essence – for me I take that art seriously. It’s not just about picking a few tracks off iTunes or selecting some random eclectic stuff just to throw it down. I like to feel like I’m building something and in a way that is also what my radio shows have always represented. Getintothis: Speaking of your radio show. You’ve just recently had Kamasi Washington as a guest on Radio 6. He’s obviously been doing great with his album and has an upcoming show at the Barbican as well as featuring on the new Kendrick record. Do you think that the appearance of jazz musicians alongside these new school MCs provides a new generation with the agency to look deeper into the source of the music they listen to? Gilles: “I think it’s a good time for hip-hop. It’s great to see the likes of Flying Lotus and Herbie Hancock as well as Kamasi and Kendrick working together. The music put out on Brainfeeder (Flying Lotus‘ own imprint) is so important. It goes so against the mainstream sound but not at all in a negative way. “I honestly think it’s a really interesting time, with the mashup of electronic music and dance music fusing itself with hiphop. You get people like Flying Lotus who have that free-jazz meets hip-hop meets techno sound. Getintothis: He’s definitely giving himself a good education! 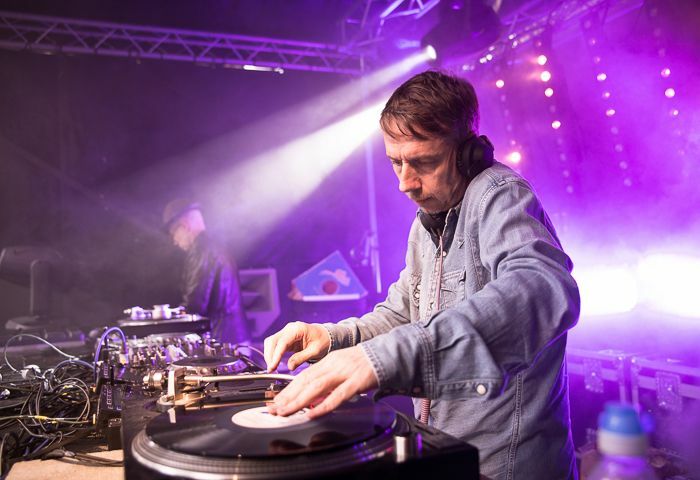 Gilles Peterson will be headlining with an extended set for Freeze at The Garage on December 18 and tickets can be found on the Freeze Skiddle page. Alternatively you can like and share our post below to be in with the chance of winning a pair of tickets for the night. If you can’t wait that long his weekly show on BBC Radio 6 Music can be heard every Saturday from 15:00.